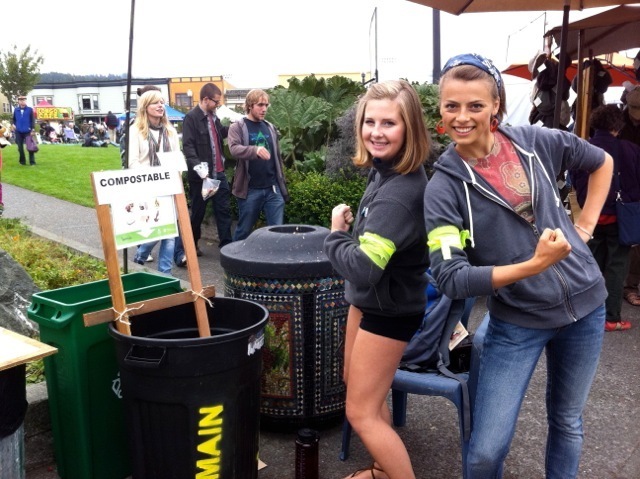 ARCATA – Since the North Country Fair, Zero Waste Humboldt has been contacted by several organizations seeking technical assistance for reducing waste at their upcoming events. Recently formed, Zero Waste Humboldt is enthusiastic about the comprehensive zero waste approach to reducing waste and working with local businesses, governments and community groups. As you rethink how you organize your event in order to reduce waste, you must start with a commitment to: sufficient advance planning, an emphasis on prevention strategies first, a few extra volunteers to help make the initial changes the first year, upfront investment (usually recovered in disposal cost savings over time), integrating zero waste principles in all aspects of contracts, entertainment, purchases, facility selection, event promotion, and careful recordkeeping to monitor and measure your progress. There are many considerations, but here are a few basic pointers for your zero waste event planning. Some strategies work better than others depending on the numbers of people you will host and whether this is a one time only event, held annually or more often. 1. Pack-it-in; pack-it-out has become eco-chic. Offer a small incentive for attendees to bring their own cup or mug and cloth napkin. 2. Local rental businesses have everything –cups, glasses, plates, cloth napkins, etc. in several sizes– to reserve in advance. Some caterers are all set up to provide the utensils, plates, containers, linens that you need. 3. For a small fee and a hefty returnable deposit, another organization, local government, church, school, grange, etc. may be willing to lend you what you need. 4. Line up volunteer dishwashers. 5. If you plan to regularly hold events, consider buying everything you need from one of our fine local secondhand shops. A joint purchase of two or three organizations to share rewashable dinnerware might be a cost-effective, practical way to go. 6. Your local recycling and garbage collectors will advise you on how to prepare your recyclable discards for them, and you can contact Humboldt Waste Management Authority for advice on recovering food waste and compostable material. 7. Measure and record how much and what types of waste you generate at each event so that you can monitor your progress in the never-ending quest to reduce waste. For more information, email contact@zerowastehumboldt.org. This entry was posted on Monday, November 12th, 2012 at 10:34 am	and is filed under News, Community, Environment. You can follow any responses to this entry through the RSS 2.0 feed.